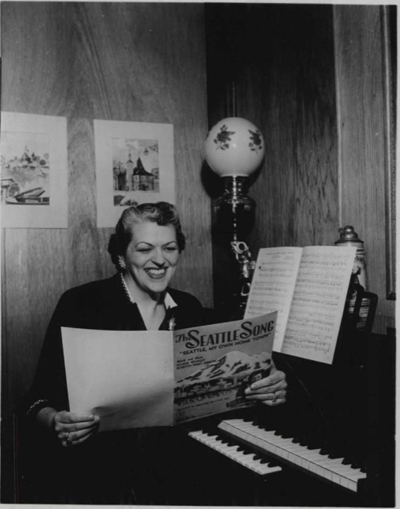 THE SEATTLE SONGWRITERS CLUB was an organization formed in the mid-20th Century to provide budding composers with a supportive place to compare notes with their peers, and where they could safely debut in-the-works songs for constructive critiquing. 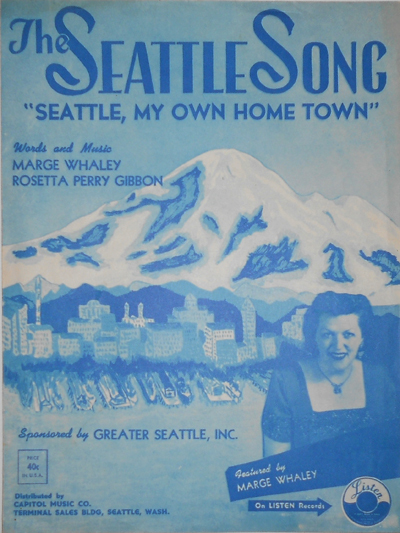 Among the members who progressed to the point of seeing their tunes published as sheet music – and/or even recorded by professional musicians – were Rosetta Perry Gibbon (who had gained some local notoriety back in 1932 when she won a Seattle Chamber of Commerce contest with her song, "Ho The Navy, Hail The Navy" which was penned to honor Fleet Week) and Marge Whaley (seen here at her piano). Whaley was a popular pianist who went on to cut her own recordings for one of Seattle’s pioneering record companies, Celestial Records, including her toe-tapping 1958 classic “Marge’s Monday Boogie.” But the disc spotlighted here is one that preceded that by a few years. 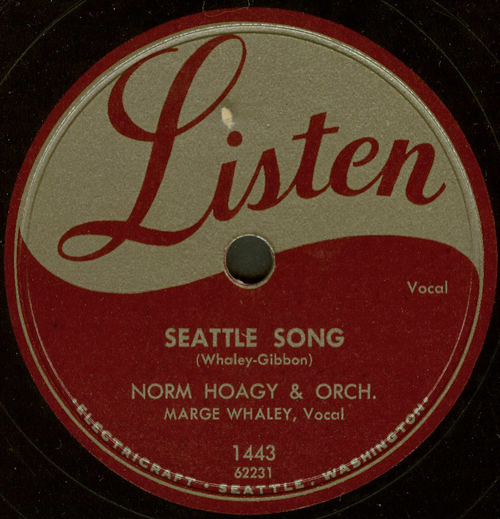 “The Seattle Song” was written by Gibbon and Whaley, recorded by the Electricraft Studio, performed by the Showbox Theatre’s house-band, the Norm Hoagy Orchestra (backing Whaley’s vocalizing) – and issued in 1952 by the Listen Records label. This whole production was sponsored by Greater Seattle Inc. – the organization that launched and managed this city’s annual summertime Seafair festival. 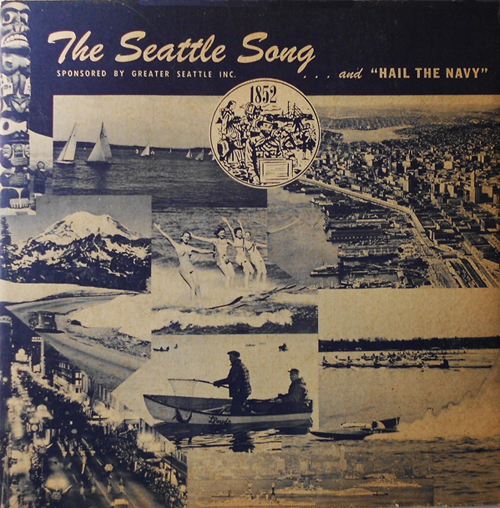 Photographs on the disc’s cardboard cover depict typically touristy attractions including scenes of the Seafair “Torchlight” Parade, waterskiing babes, sailboats, a totem pole, fishermen, Naval ships on Puget Sound, and Mt. Rainier. Liner notes were provided by local music impresario, Arthur “Art” Benson, who promoted jazz music locally and was later associated with Celestial Records. 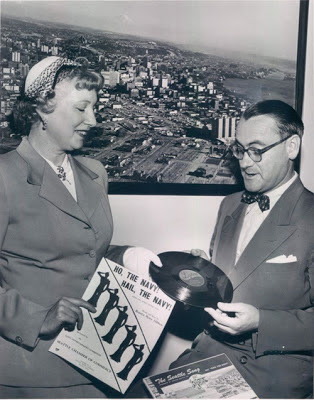 And lastly we see Gibbon in July, 1952, showing off her new record "The Seattle Song" / "Hail The Navy" to Mr. Don Follett, manager of the Chamber of Commerce.